Cyclesnack: Second Ride, better than the first! The Dillinger felt much better this time around. The night before I did some adjustments to the headset, the front wheel and tightened the EBB to 6.5 nM, according to Chad at Soul Cycles. 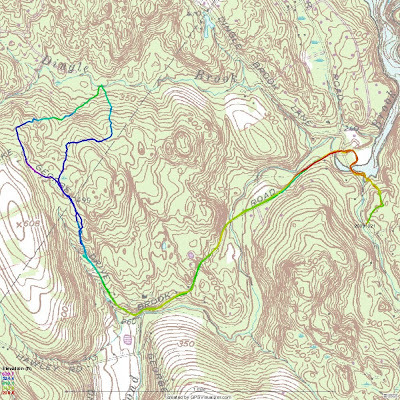 I started my ride at Silver City and went into the forest and rode the Pond Brook Connector, through the new section that built this past summer, through the boat ramp, a bit on the old Shepaug RR bed and then up Pond Brook (dirt) to Lake George and into the ROW. The ROW was resplendent with fall foliage, however all those pretty, crunchy leaves made things rather slippery in the steepest of climbs. I am really starting to notice the difference between riding this bike and when I had my Fetish Fixation set up as a 69er. Rolling over stuff is much seems much easier. Also, the aluminum frame is a lot more rigid that the steel Qball and combined with the rigid fork the bike really climbs well. After the first ride I felt pretty beat up but after this second ride I feel much better. Now, I can't wait to ride it again and a again, and again! In my move to ride lighter, I went out and got another water bottle mount pump from Topeak. However, I found that it doesn't stay securely in it's holder and I now hate it. I will have to switch the one from the Qball with this one.